Hope you are all having a great weekend. I've had some sad news today so I've been busy making sympathy cards. They wont be blogged. Today I have the card for the 5yr old daughter of friends of ours. 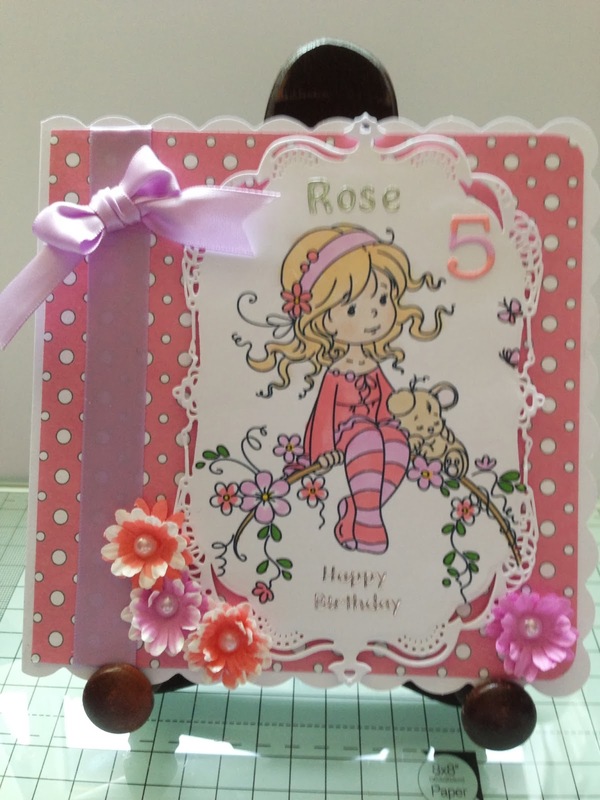 Base card is a 6 x 6 scalloped card from stash. Backing paper and ribbon from stash. Flowers from stash and coloured with FM's. Image is from Wee stamps by Sylvia Zet. Coloured her in with FM's and cut her out with Spellbinders Gold Label 4 and fixed to card with foam pads. The number 5 is a Memory Box die and coloured with FM's. Peel offs were used too. I will visit your blogs too. I'm so sorry to read that you have had sad news. They will appreciate the cards you have made. My thoughts and prayers go to everyone involved. So sorry to hear of your loss, thought and prayers winging their way over to you. On a lighter note, this card is simply beautiful, Rose will love it!! all concerned. On a lighter note the card for the little girl is gorgeous. Beautiful Pat! Sorry to hear your sad news hun. Sorry to hear about the news, sending my hug and love.